Fuel: Pain au chocolat. Mars bar, petit dejeuner (with double helping of bread and coffee and myrtle berry jam! ), pizza, burger, beer and wine in Luchon. We’ve just signed up for our favourite ultra run of the year – Oscars Hut2Hut in Australia. It’s 100km over some incredible mountains in the Victorian alps, to raise awareness and funds for those affected by autism. It’s a huge challenge, and February 2019 will be the third time we take it on. I can’t wait. 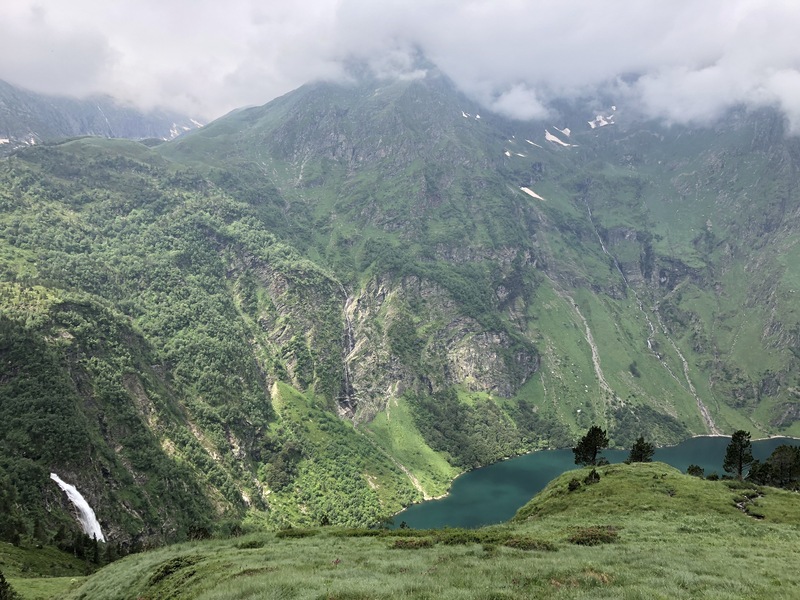 Why am I thinking about this today, as we climb over another pass, another lake, into another Pyrenees village, far far away from Australia? Today that was my motto! The day started blissfully. 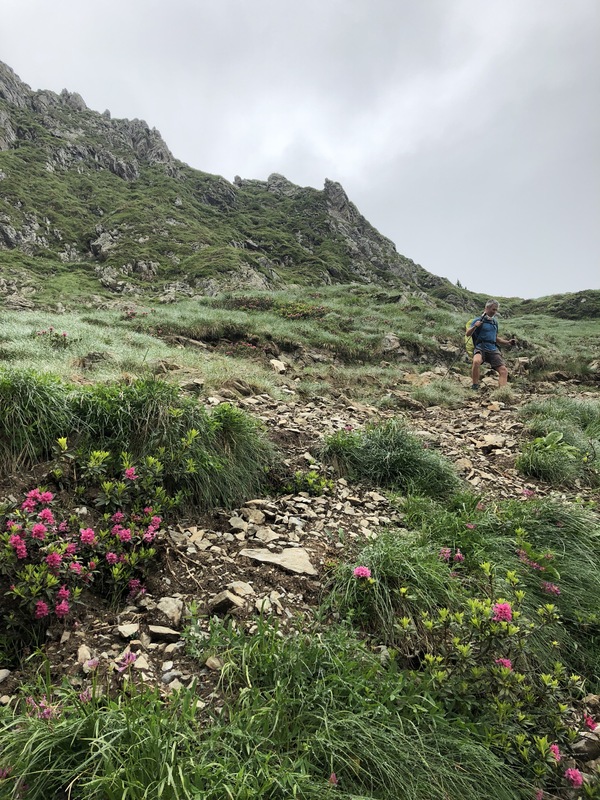 We climbed from our isolated spot in the misty valley over an icy pass and down to the Auberge d’Astau for a simple petit dejeuner. 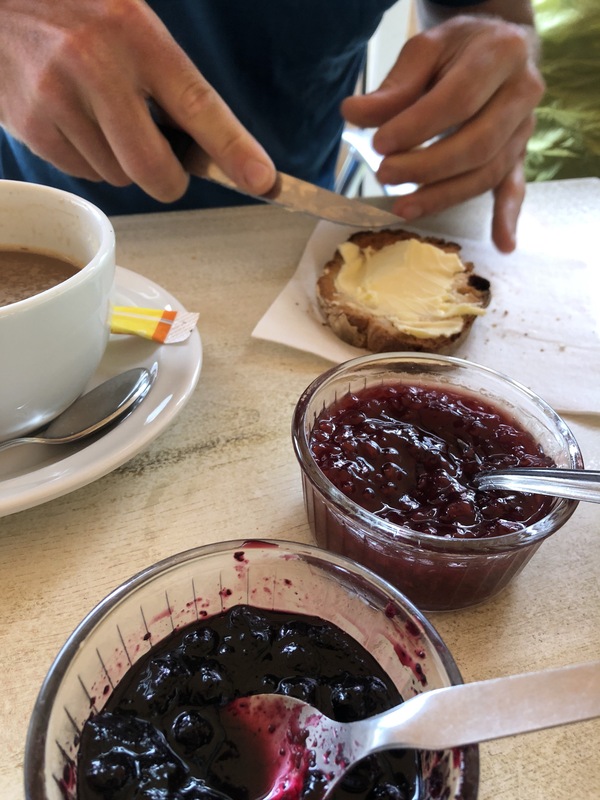 Coffee and hone-made myrtle berry jam filled us the energy we needed to speed past school kids and holiday makers up to the lake, and we barely gave it a second glance as we started climbing again. Everything was feeling great. Muscles were relaxed. Minds were clear. Caffeine was flowing through our veins. Life was good, we though, today’s the day we’ll reach Luchon and take our first full day off! Then the switchbacks started, the mist descended and I couldn’t see the top. Something I’ve realised during this adventure is that I really need a goal – if I can see what I’m aiming for, I’m okay. I can pace myself, get into gear and just do it. But when I can’t see the end goal, when it’s not clear what I’m aiming for, things get unbearably tough. I start overthinking: how much longer is it? What if I can’t make it? What if there’s another climb hidden behind this one? Mat didn’t have this problem. He just took his time and keep going. But I was in all sorts of strife. The switchbacks kept coming and I kept wondering. Mat kept hiking and I kept thinking. I tried the counting technique – my usually foolproof strategy of finding a rhythm through counting, sometimes in different languages to make things interesting. But even that wasn’t working. Look, I realise this wasn’t actually because of the climb. We’re used to climbing and actually prefer going up to going down. This was all because I was counting the minutes until our Zero Day in Luchon. Don’t get me wrong, I’m absolutely loving the trail, the challenge and the landscape, but sometimes you just crave a glass of wine and a long lie-in, right?! 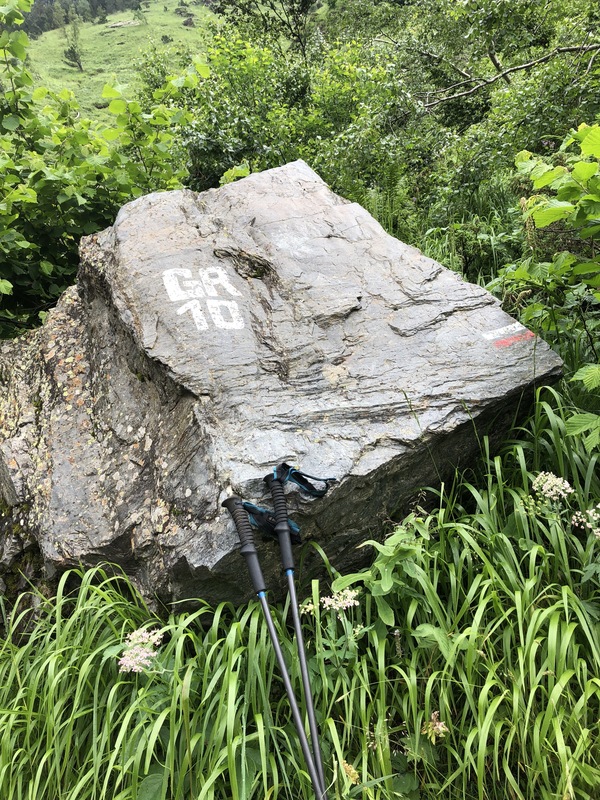 Eventually, after what seemed like days but was only an hour and a half, we hauled our legs over the final rocks onto the Hourquette des Hounts-Secs (translation anyone?). I almost cried from relief. We celebrated with a Mars bar. 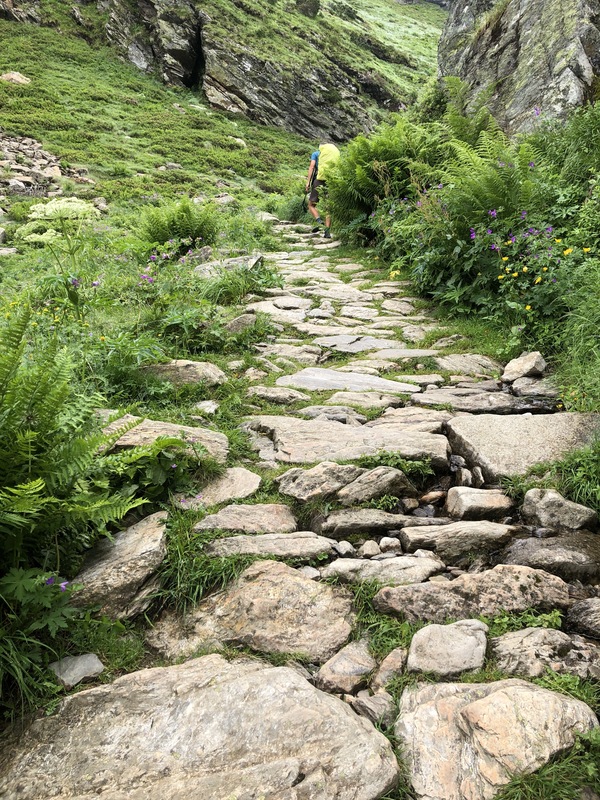 From here, it was a few more kilometres of ups and downs before the Col de la Coume de Bourg – our final climb of the day. The markers were covered in ice, so we spent some time working out the right way with the GPS. Then, just when we thought we were home and dry (vino here I come! ), there was a sign. Using my poor French, I worked out that an avalanche risk meant we had to take a detour to Superbagneres, the ski village. 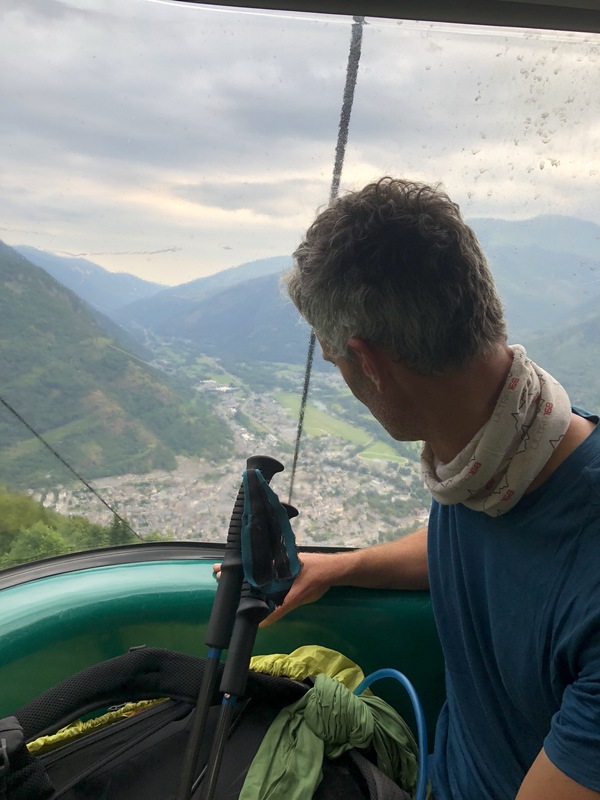 We were so close to the end, I could smell the pizza, but we had yet another six kilometres of ups and downs and not knowing before we could sail down the mountain in a cable car. And sail down the mountain we did. Two hours is how long it would have taken us to descent the mountain into Luchon. Two hours of knee-crushing descent from 1804m to 650m. That cable car ride was the best 15 euros I’ve ever spent. Oh, except for the pizza and wine at the bottom. That was pretty good too. Let the Zero Day begin!